A best-selling author looks at modern medicine to bridge the gap between patients and "health care's hidden heroes." 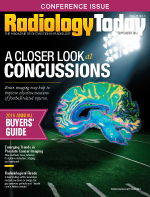 Carolyn Jourdan, JD, a best-selling writer of medical nonfiction and fiction, has authored two radiology-focused works, Talking to Skeletons: Behind the Scenes with a Radiologist and Radiologists at Work: Savings Lives with the Lights Off. But she admits she never thought she'd end up here. "I grew up in a rural family doctor's office in the Smoky Mountains. My dad was a solo practitioner for 40 years in a small town east of Knoxville [Tennessee]," she says. "I was supposed to be a doctor, but I'm incredibly squeamish and a tad hysteria prone, so I went into biomedical engineering instead." After earning degrees in biomedical engineering as well as law, she embarked on a high-profile career in Washington, D.C., first at the Nuclear Regulatory Commission, then as Nuclear Counsel to the Senate Environment Committee, and eventually doing special projects for the Smithsonian and public television. Then, one day she answered an emergency call from her father, quite literally, and her life and career changed in an instant. "At the age of 45, I got a call from my father saying my mother had had a heart attack," she explains. "For over 30 years, she'd worked as his receptionist, nurse, lab tech, bookkeeper, and sidekick. My father asked me to come home and fill in for her for a couple days. Because he treated about a third of his patients for free, he couldn't afford to pay anyone to do her job. I thought I was going to be there for three days, but I ended up being an unpaid receptionist, living in my parents' basement for four years." Months into a new, and uncharacteristic, form of public service, Jourdan found herself in the self-help section of a Barnes & Noble bookstore, struggling to come to grips with the dramatic and sudden shift in her day to day. She stumbled upon a book that noted writing's potential benefits for posttraumatic stress disorder—and write, she did. Her father eventually retired, but Jourdan kept writing. First up was Heart in the Right Place, a memoir "about the down-sizing of my life from white marble columns, gilded domes, and Neiman Marcus to Naugahyde, peeling linoleum, and Walmart." It became a best-seller. Four top-10 national best-sellers later, she continues to focus on medical nonfiction, where she presents ground-level portraits of doctors at work, in the hope of healing the breakdown of the doctor-patient relationship caused by modern health care. In our chat, Jourdan discusses what led her to turn her focus to radiologists, what changes she observed in her 15-year span of interviews (including seven long nights observing one radiologist), as well as what she hopes these two works will tell readers about "health care's hidden heroes." Radiology Today (RT): Was there anything about radiologists themselves that drew you to this subject matter? Jourdan: Yes. When I was 6 years old, my dad went to visit a classmate from medical school who was doing a radiology residency. This man also happened to be an Air Force jet pilot. During our visit he hoisted me up into the pilot seat of a fighter plane. I thought that was the greatest thing ever. Then, he showed me a reading room, which also made a deep impression. For the longest time after that, I thought all radiologists were also jet pilots. My misconception lent an aura of glamour to the specialty. When I was 18, I won a National Science Foundation grant to work with nuclear materials at the Oak Ridge National Laboratory. A lot of the developmental work for CT, MRI, PET, and proton therapy is done in this area. Much of the commercialization of those technologies was done near there, too. So most of my life I've worked with people who were struggling to bring these technologies to market. When I decided to write about radiologists, I spoke to about 20 physicians and a lot of engineers, and the two books came from those conversations. RT: Let's talk logistics of Talking to Skeletons vs Radiologists at Work. Your work on Talking to Skeletons spans seven nights over 15 years that you spent watching one radiologist work. Tell us about that time. Jourdan: When I graduated with a biomedical engineering degree, it was the first year they graduated such majors at the University of Tennessee. At the time ('72 to '76), the holy grail that everyone was working toward was voice recognition. It took decades for that technology to be realized. But even back in the '70s, everyone knew that the first, highest, and best application of voice recognition was going to be in the controlled environment of radiology. The early uses of voice recognition technology were in place when I started shadowing a radiologist who I ended up spending 15 years with. And it just so happened that, as I watched voice recognition come online, there were tons of other changes happening as well—going from film to digital, for example, and seeing radiologists move closer and closer to the front lines of health care. I got to see that whole wave of change. I continued to shadow the radiologist and interview others for years until I had enough material for a book. But as the writing progressed, I realized I had two separate books. Talking to Skeletons turned out to be a much closer experience, a profile of one radiologist. RT: What do you most remember of those nights? Jourdan: The aesthetic aspects of it. To me, a radiology reading room is the most beautiful art gallery in the world. I also remember being astonished at the evolving technologies and increase in the workload and watching how the radiologists coped with it. RT: Would you just watch in the background? Jourdan: I don't manipulate my stories; I'm just a fly on the wall. Almost like a war correspondent—whatever happens, happens. I don't overlay a point of view onto the material. I take extensive notes during the interviews and then review them afterward to see what the material says vs going in with a preconceived agenda. For the radiologist who I shadowed off and on for 15 years, I simply sat behind him while he worked. It started in the days of film when he'd make a circuit of half a dozen different reading rooms scattered all over the hospital. By the time he retired, it had gone digital and become much more centralized. RT: Conversely, how does the experience of Talking to Skeletons compare with Radiologists at Work, which highlights 20 radiologists over 70 years of practice? How did you find these radiologists, and what was involved in interviewing them? Jourdan: It was totally different. I wanted to interview radiologists in many different subspecialties. I went out of my way to locate older radiologists because they have the broadest context for the incredible changes in the profession over the years. Interviews were mostly in person but sometimes on the phone. I got pinned down for a few days during an ice storm in Memphis and discovered by accident that radiologists are wonderful to interview over the phone because they're accustomed to speaking into the air with no other person present. RT: What were you looking for in these interviews? Jourdan: I was looking for the most memorable moments in their careers, usually that's at the times of highest emotional content, but it can happen in a wide variety of contexts. RT: So you were looking to chronicle their work—the best or the most interesting moments of their work. Jourdan: Yes, the incidents that made the biggest impression, the things that carved themselves into their minds. Those make for the most human moments, the most relatable events for a reader. RT: What did you learn from your efforts into these works about the business of radiology, radiologists themselves, and the gravity of the work they do? Jourdan: I learned about the frustrations radiologists have about the excessive use of imaging and the reluctance of doctors to seek expert guidance from radiologists about the best tests to order to get the specific information they're seeking. Excessive or incorrect use of radiology increases health care costs and also wastes time. I could feel their disappointment with the lack of collegiality that's being imposed by today's health care system. Physicians used to come to the reading room to consult with radiologists and look at the images with them. The doctor-to-doctor dialog was very meaningful, and that's being lost. RT: So you noticed similar frustrations among the radiologists you interviewed. Did you notice any other similarities or differences among them? Jourdan: There's a superficial peacefulness to being in a reading room that won't last once you start focusing on the content of the images. The frozen black and white images are misleading, too, because they don't show you what the patient is actually experiencing at that moment. Radiologists have to keep an emotional distance from the gravity of what they're looking at, but the cumulative effect of looking at those images all day struck me. I think radiologists pay a price for that, and I hadn't realized that previously. Readers often comment about that aspect of the books. They never thought about the pressure of the radiologists' job, and they were surprised to read about the effect that the work has on the doctors as human beings. RT: Did you find that radiologists were affected differently? Jourdan: It seemed to me that radiologists experience a type of trauma from looking at so many images of sickness and injury. They're continually confronted with a view of the world that's not normal. I think they suffer from having to see so much of this kind of thing. One radiologist told me that one of the best things about retirement was how nice it was to see mostly healthy people. Something distinctive about radiologists is their vast, elegant vocabularies. Their dictated report is like a message in a bottle. It might be the only contact they will ever have with the attending physician on a patient's case so they have to be as clear and thorough as possible. The eloquence of their speech was noticeable in every radiologist I interviewed. RT: Is there a separate message in both books, or are they more similar than different? Jourdan: In the books I write, I want to show doctors as people—and in these books in particular, to show radiology as what it was and how it's changed. So Talking to Skeletons shows the effect of those changes on one man throughout his career. And the bigger book, Radiologists at Work, takes a wider look at what radiologists do so readers can get an appreciation for the breadth of their work. RT: So you wanted to humanize this profession. Jourdan: Yes. In one, I took an in-depth look at one particular radiologist at work. Then, to give a broader context, I highlighted the work of 20 radiologists who practiced from the 1940s to the present time. These books are my attempt to restore public confidence in physicians by giving the reader an experience of being there beside them while they work. In Talking to Skeletons, readers get more of my experience of being in a reading room. In Radiologists at Work, I am not as present in the narrative so they can have their own experience and come to their own conclusions.